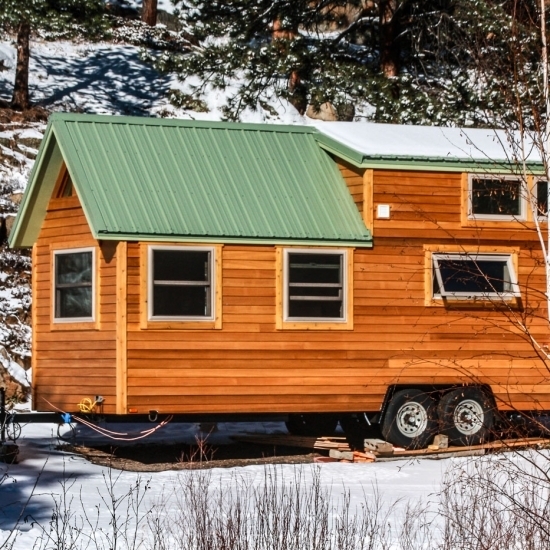 The SimBLISSity 32 ‘ x 10’ Nimbus is the largest Tiny Home SimBLISSity has built so far. A 10’ wide Tiny Home provides 25 % more living space than an 8’ wide Tiny, a significant difference. 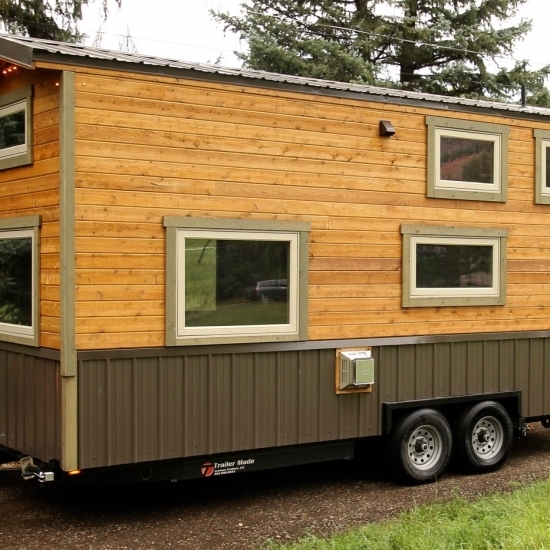 The wave of the future will be a lot more Tiny Homes built to this width. This home was built with the special needs of a family member in mind. These features include extra width for wheelchair access, ground floor bedroom, steel loft supports for metal track/sling installation from bed to bathroom, and large shower with room for a portable bathtub. One of the most striking features of the SimBLISSity Nimbus is the abundant use of stunning Blue Stain pine on the high ceilings and for accent on walls as well as for the custom-milled window trim. The bright and spacious Great Room features a 10’ X 12’ Living room with large, Energy Star rated windows and room for a full-sized couch. The grand sized kitchen has French doors at the end that will open to a deck. Butcher block counters on both sides create sufficient workspace for creative food preparation. There is an under mount, black granite composite sink, a four burner gas range with oven, and LG Stainless Steel refrigerator. The convenience of having a washer/dryer combo unit facilitates more time to be at home. The kitchen is located in the Great room creating an enjoyable open living space. The 4’ 6” x 7’ bathroom has a large tiled shower that is special needs accessible. There is a flush toilet and a vanity with drawers. A master bedroom is located on the main floor with radiant heat bar for extra warmth. There is a large closet with loads of storage built into the stairway that leads to the sleeping loft. The extra large sleeping loft is 7’ x 14’ which provides plenty of room for additional storage, office space, playroom for the kids, or second bedroom. Insulation: R-24 – R-28, High altitude formula, Anti-microbial, sprayed in Closed-cell foam.